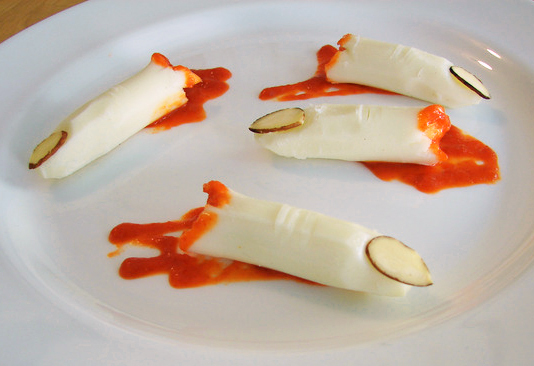 Food Wishes Video Recipes: Halloween Party Food Idea: Cheesy "Severed Fingers"
Halloween Party Food Idea: Cheesy "Severed Fingers"
If you're looking for a mildly disgusting, yet fun and creative Halloween appetizer for an upcoming party, consider these severed fingers made from string cheese. I ran this video a couple years ago, but wanted to repost in case you hadn't seen it before, or just needed a reminder. Don't be scared...click on the link below the photo and check it out! Enjoy! Click here to watch the video and read the post. For the office Halloween potluck, I said I'd bring 'Lady Fingers.' Can't wait to see the reaction. For the Halloween potluck tomorrow, I said I'd bring 'Lady Fingers.' Can't wait to see the reaction.